Another busy day! 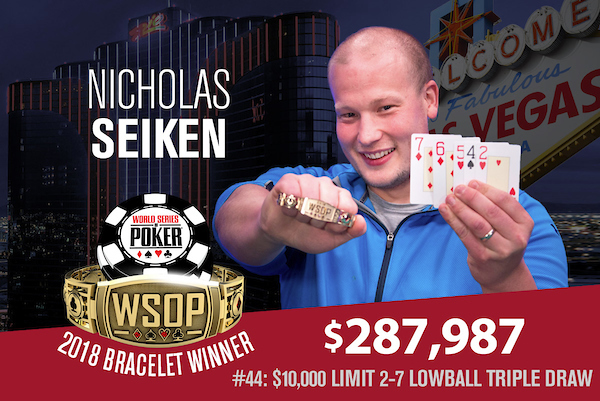 Three more bracelets were won on Saturday at the 2018 World Series of Poker, one of which went to a former PocketFives no.1 player. Meanwhile, a final table was set, with a controversial figure in the poker world holding the chip lead over the final six. Here’s all the news from June 23. Last year, Shaun Deeb got heads-up versus Ben Yu in the $10K Limit 2-7 Triple Draw Championship. Yu got the best of it that day, forcing Deeb to settle for second place. Former no.1-ranked player Deeb got his revenge on Saturday though, denying Yu his third bracelet. 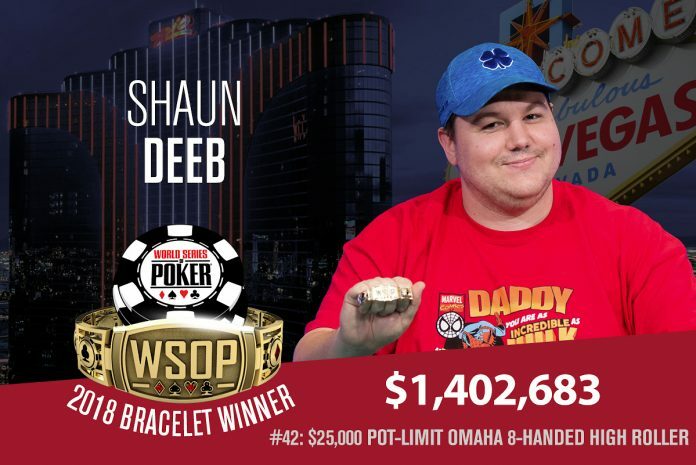 He won the heads-up to win Event #42: $25,000 Pot-Limit Omaha 8-Handed High Roller for his third WSOP bracelet, and a massive score of $1,402,683. With six players returning on the day, the two had battled through a tough line-up which included Ryan Tosoc (6th), Jason Koon (5th), defending champion James Calderaro (4th), and Poker Hall of Famer Scotty Nguyen (3rd). Nguyen held the chip lead coming into the day, but Deeb grabbed the chip lead early. Tosoc stuck around for just four hands before making an exit, getting it in with middle pair and a flush draw versus Yu’s top pair, which held. Koon fell next, jamming with top pair but getting called by Deeb with two pair and failing to catch up. Calderaro put up a great title defence, but ultimately fell in fourth. He got unlucky to do so, with him and Deeb both getting it all in with the same top two, but Deeb hit a runner-runner backdoor straight for the KO. Three-handed, Yu doubled Nguyen to leave the 1998 Main Event champ short. Nguyen them jammed with two kings and a ten-nine, which Yu called with two queens and an ace-three. An ace hit the flop, and that proved enough. Heads-up, Deeb and Yu swapped the chip lead a couple of times, but in the end the match was short. Yu got it all-in on a low board with an overpair, straight draw and flush draw, while Deeb had a bigger overpair and a gutshot. The board bricked for Yu, giving Deeb the win. “No one really ever put me in a bad spot,” Deeb said after his victory. “I was able to control the pot sizes the way I wanted to almost every hand. That really helps, to not get in an inflated pot with a marginal hand. Everyone played their best game, I just ran the best. Another super fast day played out in Event #45: Big Blind Antes $1,000 No-Limit Hold’em (30 minute levels), with 41 players getting down to a winner in less than seven hours. 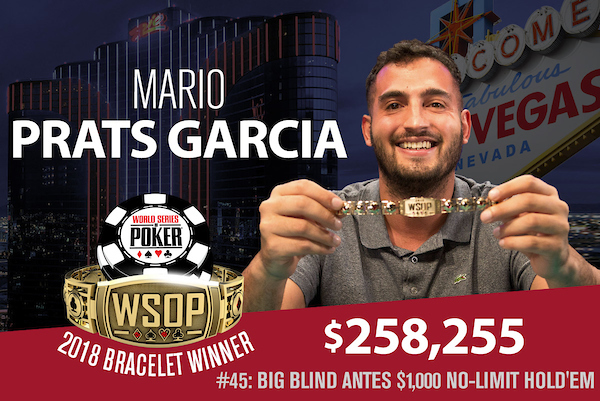 Mario Prats Garcia ended up victorious, taking down his first bracelet and the $258,255 first-place prize. Garcia has had close calls in the past, including a runner-up finish last year, but now has a piece of WSOP jewellery. He defeated PocketFiver Matthew ‘theginger45’ Hunt heads-up for the title, securing the win after just three hands. Hunt took the first pot, then managed to double-up in the second. But the third would end it all, when Hunt made a straight only for Prats Garcia to have a flush. You can find the rest of the final table results below, while some of 1,712 entries who went deep in this one include Justin Oliver (37th – $5,376), Manig Loeser (33rd – $6,505), Conor Beresford (32nd – $6,505), Esther Taylor (21st – $7,967), Joseph Cheong (19th – $7,967), Kathy Liebert (18th – $9,877), and Athanasios Polychronopoulos (11th – $15,730). Here’s one for the books: Nicholas Seiken, normally a NLHE player, had never played a stand-alone 2-7 Triple Draw tournament before entering Event #44: $10,000 Limit 2-7 Lowball Triple Draw Championship. Three days later, he’s a bracelet winner and $287,987 better off. Seiken first played the game in an 8-game mixed event, and clearly took to it like a deuce to water as he defeated a tough final table today which included bracelet winner Randy Ohel, three-time bracelet winner Farzad Bonyadi, one-time bracelet winner Hanh Tran, Christopher ‘Apotheosis’ Kruk, Matt Glantz, and start-of-day chip leader Michael Noori. Ohel would be his heads-up opponent, and in the final hand Ohel made a jack-nine but that was crushed by Seiken’s seventy-six. Yesterday we told you how a bracelet in Event #47: $565 WSOP.com ONLINE Pot-Limit Omaha 6-Handed was awarded, making it the first online PLO bracelet handed out. However, the tournament went deep into the early morning hours Friday night, so we didn’t have a winner when we went to publish. We can now tell you that it was Matthew ‘MattEMenz’ Mendez who took it down for a $135,077 score, defeating a tough final table which included Anthony Zinno and Ankush ‘pistons87’ Mandavia. Mendez is also the first bracelet winner to play outside of Nevada. Mendez took this one down from the comfort of his New Jersey home. After 1,071 players took a shot, a final table of six has now been set in Event #43: $2,500 No-Limit Hold’em. The player holding the chip lead is none other than 2017 Player of the Year Chris Ferguson. Ferguson is seeking his sixth bracelet, and is in good shape with a massive 5,680,000 stack. He’ll be joined by Timur Margolin (3,520,000), Ismael Bojang (2,610,000), Michael Marder (1,765,000), Dylan Linde (1,330,000), and bracelet winner Ryan Laplante (700,000). A huge pot gave Ferguson the big lead. Seth Davies was all-in with pocket fives and Bojang called with ace-king. Ferguson then woke up with pocket kings, busting Davies and getting a big double through Bojang. There’s $507,274 up top in this one, while all six are currently guaranteed $87,189. The finale kicks off at 12pm Sunday. Event #48: $1,500 No-Limit Hold’em MONSTER STACK got going with Day 1A on Saturday, with 2,246 players taking part. Ten levels later and just 723 advanced. There are multiple notable PocketFivers who bagged top 10 stacks, including Jon ‘PearlJammer’ Turner, Marc ‘sluglife’ MacDonnell, Shyam ’s_dot111’ Srinivasan, and Kenny ‘SpaceyFCB’ Hallaert. It’s James Karamanis who leads the field though, bagging up 163,600 when the bags were brought out. Others who made it through include Calvin ‘cal42688’ Anderson (116,600), Daniel Strelitz (90,600), Bart Lybaert (77,400), and Annette Obrestad (68,500). Some of those who failed to find a bag today include Phil ivey, Phil Laak, Joe Cada, Greg Raymer, Scott Blumstein, Arkadiy Tsinis, Dara O’Kearney, Kenna James, Mike Leah, Parker Talbot, and Antoine Saout. Day 1B begins at 10am tomorrow. Out of the 402 players who took a shot in Event #46: $2,500 Mixed Omaha Hi-Lo 8 or Better/Seven Card Stud Hi-Lo 8 or Better, only 15 remain after another ten levels on Day 2. There are three players in contention for their second bracelets: Eric Rodawig, Cyndy Violette, and Hani Awad. However, it’s Ian Shaw who holds the overnight chip lead. The bubble burst today at 61 players, and a few who failed to reach the cash include Daniel Negreanu, Phil Ivey, Shanon Petluck, Nicholas Derke, Tommy Hang, Robert Campbell, John Hennigan, Barry Greenstein, Jeff Lisandro, Phil Hui, Marco Johnson, Kate Hoang, and Jesse Martin. Some of those who did make a profit include Scott Abrams (60th for $3,736), Joe Hachem (49th for $3,891), Konstantin Puchkov (47th for $4,165), Robert Mizrachi (45th for $4,165), Ian Johns (38th for $4,577), Scott Clements (33rd for $4,577), Jameson Painter (23rd for $5,969), and Ron Ware (21st for $5,969). Action gets going again at 2pm tomorrow, and they’ll play down to a winner. Whoever that ends up being will bank $214,291, while they’re all currently guaranteed $7,074. As the $25K High Roller came to an end, Event #49: $10,000 Pot-Limit Omaha 8-Handed Championship got going, attracting 439 runners. Ten levels later and 175 players will be returning for tomorrow’s Day 2, all led by chip leader Ryan Hughes who ended with 475,400. He’s joined at the top of the counts by Veselin Karakitukov (350,800) and Ben Lamb (314,100). A few notables who made it through include poker Youtuber Joey Ingram (258,500), Michael Kamran (290,000), four-time bracelet winner Michael Mizrachi (275,100), Stephen Chidwick (245,300) and six-time bracelet winner Layne Flack (206,400). They’ll all be back at 2pm Sunday for Day 2. Sunday June 24 is mostly a day of additional Day 1s. At 10am you’ve got Day 1B of the Monster Stack, while at 7pm it’s Day 1D of the PLO Giant. The only new event to begin kicks off at 3pm: Event #50: $1,500 Razz. However, we should have at least two new bracelet winners to tell you about, so make sure you come back tomorrow for all the news.